Captain Noel Chavasse VC and Bar MC, is the most decorated solider who served with the Regiment. There are several memorials to him both in this country and abroad. There are memorials in the following locations. Liverpool College, Mossley Hill, Liverpool: The plaque that was originally at the HQ of V (The Liverpool Scottish) Company at Forbes House, Childwall, Liverpool and later at the Liverpool Scottish Museum, Botanic Road. Brandhoek, Ieper/Ypres in West Flanders: Brick plinth and plaque in the churchyard beside the main road running west from Ieper with flagpole and Union flag to the side. This is within walking distance (across the main road and the level crossing) of the military cemetery where he is buried. Abercromby Square, Precinct of University of Liverpool:A Blue Plaque' has been placed on the wall of the School of Education which had previously been the Bishop's Palace and thus the residence of Bishop Chavasse. Chavasse Memorial originally at Forbes House in Childwall, Liverpool - Erected 1979. At the suggestion of Brigadier Tom Robbins, a Liverpool Scottish veteran of the Great War, an appeal was made and the memorial was paid for by the subscription of over 200 members and friends of The Liverpool Scottish. The money was raised within six weeks. 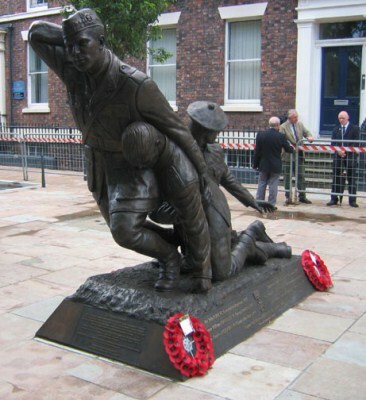 The work was executed by Mr Alan Roberts, a Liverpool craftsmen, and features individually cast relief replicas of the First World War bonnet badge of the Liverpool Scottish, the Victoria Cross and the RAMC cap badge. The badge of The Liverpool Scottish measures 13 cm across. On the closure of Forbe House, this memorial went into store and was re-erected at Botanic Road in the Liverpool Scottish Museum. The Regimental Trustees have now passed the plaque to Liverpool College, Chavasse's old school, for display at the College. You can play a version of the pipe tune 'Captain Noel Chavasse VC' written by the late Pipe Sergeant Glyn Pritchard of The Liverpool Scottish for the occasion of the unveiling of the Chavasse memorial at Forbes House in 1979. It is recorded electronically in MIDI format by 'Bagpipes at Best'. The copyright to the tune itself belongs to the estate of the late Glyn Pritchard. He was twice awarded the Victoria Cross for conspicuous bravery and devotion to duty in rescuing and caring for his wounded comrades whilst under direct fire. On the second occasion he received severe wounds, refused to leave his post and subsequently died. The quotation at the end, "Courage is the Quality Which Guarantees All Others" was included at the suggestion of Brigadier Robbins who was visiting Liverpool from his retirement home in France. It was understood to originate from Winston Churchill but it has been hard to confirm this origin. Research led to the publications of Professor R.V. Jones, a man at the heart of scientific research during the Second World War, as related in his book The Secret War, and to Professor M.R.D. Foot, the historian. Correspondence with both these men left the original source of this quotation obscure but it would now seem that it can be traced to Sir Winston Churchill in his book Great Contemporaries (1932) when writing of King Alfonso XIII of Spain: "Courage is rightly esteemed the first of human qualities, because as has been said, it is the quality which guarantees all others". This has not yet been verified by reference to the book itself. Brigadier Robbins had returned to Liverpool in 1979 for the service, in the presence of H.M. Queen Elizabeth, that marked the completion of the Anglican Cathedral . He had been present as a choirboy when King Edward VII and Queen Alexandra had laid the foundation stone in 1904. The memorial is of contemporary design in local brick with an acrylic plaque with a Union flag on the adjacent flag staff. It was erected by the local members of the Flambertus History Society of Vlamertinge and unveiled in 1998 by Captain Edgar Chavasse. It reflects the theme of Ieper, City of Peace, initiated by Pope John-Paul II on his visit to the city. A party of about 60 members of the Liverpool Scottish went over to Ieper to see this memorial unveiled. There was a presentation in the church prior to the ceremony, television crews driving madly around in ex-army 4WD vehicles, drinks in the local pub and then a progress through the battlefields of the salient led by Piet Chielens of the 'In Flanders Fields Museum' (via a detour through the grounds of Chateau Elverdinghe, the scene of the Liverpool Scottish dinner in honour of Noel Chavasse's first VC) and a much more refined 'academic' presentation and reception in the Cloth Hall in the late afternoon. Explanatory Notes: Captain Noel Chavasse was the medical officer of the 1/10th (Scottish) Battalion of the King's (Liverpool Regiment), generally know as the Liverpool Scottish, and was the only man to win the Victoria Cross (the highest award for gallantry) twice during the First World War. Blue plaques: English Heritage commemorates people with Blue Plaques if they have been dead for 20 years or were born more than 100 years previously. They must have a strong reputation and have gained recognition through their life and work. Only one Blue Plaque is erected for any person. They are circular and are about two feet (60 cm) in diameter. 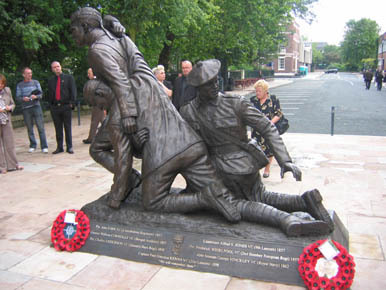 A Statue dedicated to Liverpool winners of the Victoria Cross depicting Captain Chavasse with a Liverpool Scottish stretcher bearer and a casualty. This fine one and a quarter life-size statue was sculpted by Tom Murphy, the well known Liverpool sculptor, whose other work includes statues of John Lennon (John Lennon Airport -previously Speke Airport), Dixie Dean (Goodison Park -Everton FC), Bill Shankly (Anfield - Liverpool FC) and the Moores brothers (Liverpool city centre). It was commissioned by the Noel Chavasse VC Memorial Association (Chairman: Bill Sargeant QPM) and was unveiled in August 2008. The figure represents Noel Chavasse with a wounded soldier (who carries no regimental insignia or badges of rank) and being assisted by a Liverpool Scottish stretcher bearer. The plinth lists the Liverpool VCs as defined by the organising committee of the Noel Chavasse VC Memorial Association. At the unveiling, Ann Clayton, Chavasse's biographer, read the funeral oration of Pericles. The fund was then still moderately short of its £120,000 target (which includes an educational element for local schools) There were the families of several of the Liverpool VC winners present including nearly 50 members of the Chavasse family in a crowd of over 300 (despite the prospect of torrential rain). A large number of Liverpool Scottish glengarries were present including serving soldiers and pipers. The service was conducted by the Reverend John Williams MBE (who received an award of the Ashton Trophy in 2009 as the Padre of the Liverpool Scottish Association) and the Very Rev. Paul Chavasse, a family member. 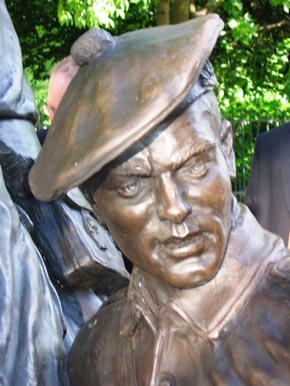 The Liverpool Scottish Regimental Museum Trust had assisted with the sculptor's research in providing uniform detail and background to the life and experiences of Noel Chavasse. Prior to the Great War, Noel Chavasse studied medicine at Trinity College, Oxford before returning to Liverpool to complete his studies and to work under Sir Robert Jones in the Southern Hospital. 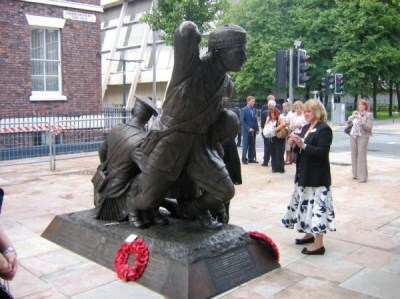 On 11th November 2010, a quarter size version of Tom Murphy’s statue and a portrait of Noel Chavasse were unveiled at the college as a result of the efforts of its alumni.